Name Variation Ann Cathrina Dohrmann was also known as Dohrnmann. Name Variation Ann Cathrina Dohrmann was also known as Dohermann. [S407] Lutheran Church, German Lutheran Church Records 1500-1971, Page 190;191. Film number 69001. [S407] Lutheran Church, German Lutheran Church Records 1500-1971, Page 170;171. Film number 69001. [S407] Lutheran Church, German Lutheran Church Records 1500-1971, Page number 623;624;311;841. Film number 1348505. Married Name 8 February 1726 As of 8 February 1726,her married name was Dohrmannen. 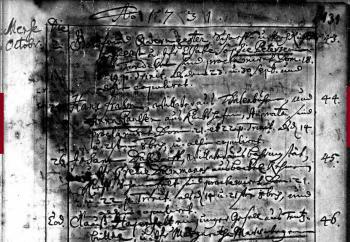 Married Name 8 February 1726 As of 8 February 1726,her married name was Doremann. Married Name 8 February 1726 As of 8 February 1726,her married name was Dormanns. 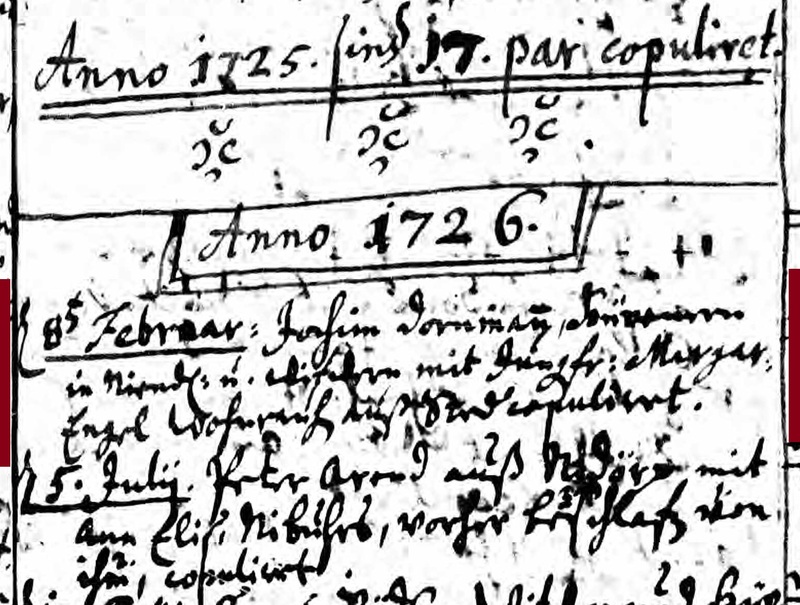 Margaretha Engel Wohnreuh was born circa 1692 at Germany. [S407] Lutheran Church, German Lutheran Church Records 1500-1971, Page number 477;689. Film number 69001. [S407] Lutheran Church, German Lutheran Church Records 1500-1971, Page number 583;584. Film number 69001. [S407] Lutheran Church, German Lutheran Church Records 1500-1971, Page number 583;584;291. Film number 1348505. [S407] Lutheran Church, German Lutheran Church Records 1500-1971, Page number 619;620;309;837. Film number 1348505. Name Variation Catharina Elisabeth Brusch was also known as Brubschen. 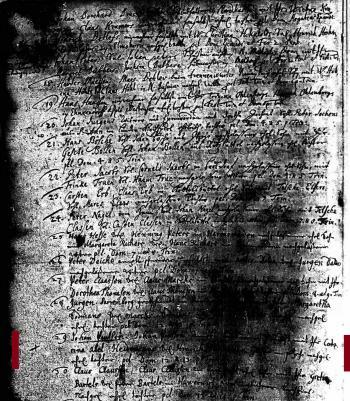 Married Name 29 April 1729 As of 29 April 1729,her married name was Dohrmannen. Name Variation Carsten Claussen was also known as Claußen. Carsten Claussen died at Germany. Carsten Claussen was born before 1720 at Germany. [S406] Lutheran Church, German Lutheran Church Records 1518-1921, Schleswig-Holstein Meldorf Taufen (Uneheliche), u Tote 1715-1748. [S407] Lutheran Church, German Lutheran Church Records 1500-1971, Film Number: 1337572. Hans Frahm died at Germany. He was born before 1716 at Germany. [S407] Lutheran Church, German Lutheran Church Records 1500-1971, Film Number: 1337560. [S406] Lutheran Church, German Lutheran Church Records 1518-1921, Schleswig-Holstein Meldorf Heiraten 1711-1770. 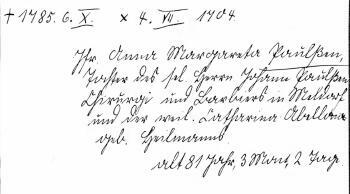 [S406] Lutheran Church, German Lutheran Church Records 1518-1921. Married Name 30 October 1798 As of 30 October 1798,her married name was Frahm. Wiebcke Cathrine Claußen was born before 1783 at Germany. She married Johann Frahm, son of Hans Frahm and Trienke Claussen, on 30 October 1798 at Evangelische Kirche Meldorf, Meldorf, Schleswig-Holstein, Germany. Name Variation Anna Margareta Paulßen was also known as Paulß. Name Variation Anna Margareta Paulßen was also known as Paulsen. Name Variation Anna Margareta Paulßen was also known as Antje. Name Variation Anna Margareta Paulßen was also known as Anna Margreta. Name Variation Anna Margareta Paulßen was also known as Panlser. Name Variation Anna Margareta Paulßen was also known as Paulssen. She was the daughter of Johann Paulßen and Catharina Abellona Heidemans. [S407] Lutheran Church, German Lutheran Church Records 1500-1971, Film Number: 1337569. [S406] Lutheran Church, German Lutheran Church Records 1518-1921, Schleswig-Holstein Meldorf Taufen u Tote 1696-1714. Name Variation Johann Paulßen was also known as Paulsen. Name Variation Johann Paulßen was also known as Johan. Name Variation Johann Paulßen was also known as Paulssen. Name Variation Johann Paulßen was also known as Paulß. Johann Paulßen died at Germany. [S407] Lutheran Church, German Lutheran Church Records 1500-1971, Film Number: 1337573. Name Variation Catharina Abellona Heidemans was also known as Heilmanns. Name Variation Catharina Abellona Heidemans was also known as Catharina Abel. Name Variation Catharina Abellona Heidemans was also known as Catarina Abel. Married Name 13 P Trin 1703 As of 13 P Trin 1703,her married name was Paulssen. 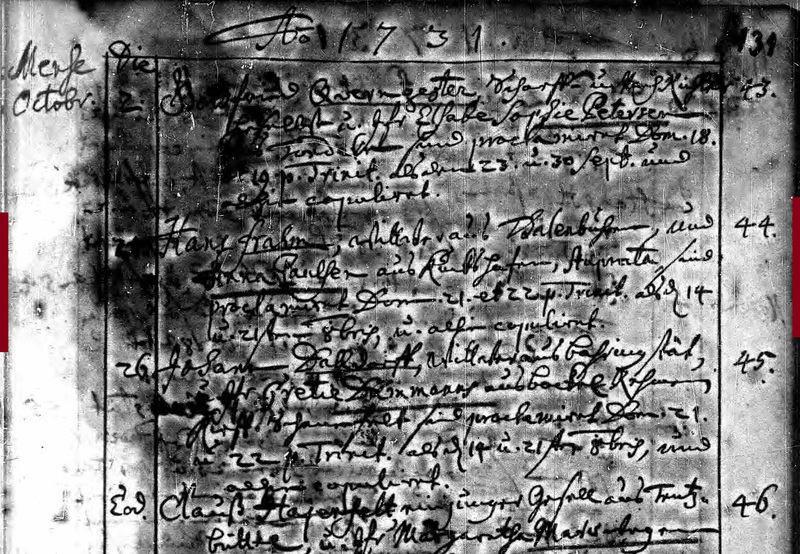 Married Name 13 P Trin 1703 As of 13 P Trin 1703,her married name was Paulß. 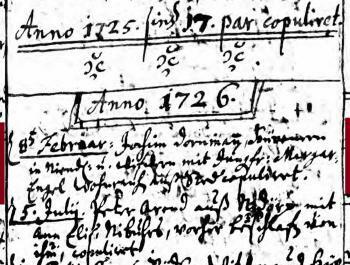 Married Name 13 P Trin 1703 As of 13 P Trin 1703,her married name was Paulßen. Catharina Abellona Heidemans died at Germany. She was born before 1689 at Germany. She was the daughter of Hinrich Heidemans. Married Name Her married name was Claussen. Unknown (?) married Carsten Claussen. Unknown (?) died at Germany. She was born at Germany. Name Variation Triencke Claussen was also known as Claußen. Jochim Caspar Brusch died at Germany. He was born before 1735 at Germany. Hinrich Heidemans was born before 1673. Name Variation Martha Brown was also known as Browne. Married Name Her married name was Stratton. Married Name Her married name was Shippy. Martha Brown was the daughter of John Brown and Ursula (?). Martha Brown married Edward Stratton I at second marriage for him. Martha Brown married Thomas Shippy. Edward Stratton I married Martha Brown, daughter of John Brown and Ursula (? ), at second marriage for him. Edward Stratton II was the son of Edward Stratton I.
Edward Stratton II married Martha Shippy, daughter of Thomas Shippy and Martha Brown, circa 1678. Edward Stratton II died in 1698. Married Name circa 1678 As of circa 1678,her married name was Stratton. Martha Shippy was born before 1663. She was the daughter of Thomas Shippy and Martha Brown. Martha Shippy married Edward Stratton II, son of Edward Stratton I, circa 1678. Thomas Shippy married Martha Brown, daughter of John Brown and Ursula (?). Name Variation Antie Paulsen was also known as Antje. Name Variation Antie Paulsen was also known as Paulßen. Name Variation Johann Hinrich Paulsen was also known as Paulßen. Name Variation Paul Paulsen was also known as Paulßen. Name Variation Trincke Paulsen was also known as Paulßen. Name Variation Gretie Paulsen was also known as Gretje. Name Variation Gretie Paulsen was also known as Paulßen. Name Variation Anna Christina Paulßen was also known as Paulsen. Name Variation Catrin Paulßen was also known as Paulsen.